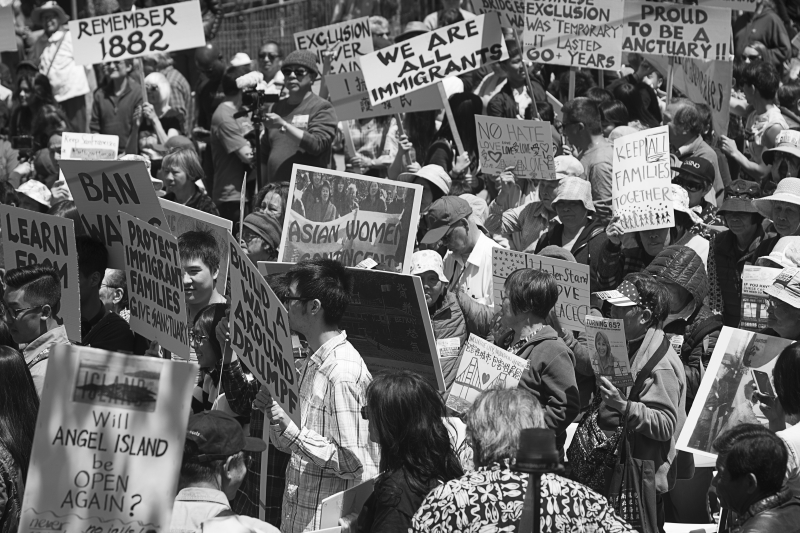 In the heart of Chinatown, feelings of resilience and solidarity reached all corners of Portsmouth Square; nearly 800 people gathered for the first ever Rally for Inclusion – a stand against recent anti-immigrant, refugee and Muslim policies and a call to end all forms of discrimination. While the issues were heavy, the rally kicked off with a charismatic welcome from Reverend Norman Fong, an uplifting performance from Charlie Chin and his band Seniors for Peace and Justice, and a special Chinese Lion Dance. Emcees Eddy Zheng and Mabel Teng took it from there, warming up the crowd with a simple chant: “Inclusion? Yes! Exclusion? No!” They also shared the good news that the Resolution [http://nomoreexclusion.org/city-resolution/] had been adopted unanimously by the San Francisco Board of Supervisors, a number of whom were in the audience to show their support. In between the chants, the speakers were a representative group; each being able to speak to a specific form and time period marked by discrimination. They generated enthusiasm and a sense of urgency among the crowd by sharing personal stories that both moved and educated. Activist Helen Zia took the crowd through America’s long history of discrimination, telling the story of Vincent Chin, a Chinese man who was beaten to death in a Detroit suburb in 1982 for the way he looked, a full 100 years after the Chinese Exclusion Act had passed. The killers paid his family, but did not serve any time in prison; Zia along with other community organizers stood up for Chin and called for a civil rights trial, but they did not get it. Echoing Zia’s message, Sameena Usman, the Government Relations Coordinator for the CAIR in SF, spoke on behalf of the Muslim community, the current group most targetted by the Immigration Ban. She pointed out the devastating increase in hate crimes against Muslims in the past year, in the Bay Area, in our own backyard, and the need to work together to end it. Dr. Satsuki Ina, Tule Lake concentration camp survivor, spoke as someone who had the experience of extensive discrimination first hand. She reflected on that time, saying: “135 years ago…75 years ago, there were no voices that stood up for us as we were torn from our families, denied citizenship, forced to attend segregated schools, denied employment and housing. No one stood up for us when we were forcefully removed from our homes and held in prison camps with an indeterminate sentence.” This acted as an acknowledgment, that while we’re in a different time, there is no telling how the ripple effects of discrimination might play out. Chito Cuellar, head of the Hotel Restaurant Employees Union Local 2, an El Salvadorian immigrant demanded the administration “stop terrorizing our communities,” and led a familiar chant: “Si Se Puede” (or “Yes We Can”). As the Rally came to a close, Zheng and Teng directed a series of positive chants tying together the day’s themes and invited the crowd to gather around the stage for a group selfie. It was an auspicious beginning for a re-invigorated, better informed community with new coalitions made to move forward together to end exclusion and champion inclusion.